Year Two (107) – High Key animal portraits on location! I have just got myself a great new hi-lite box which enables me to create a fantastic studio hi key background in a very minimal space, so I have a portable studio I can take pretty much anywhere, and create amazing hi key images. My challenge is to master putting it back in the bag … but I am sure I will. My last studio sessions for 2015 – Old Bakery – and the idea was pets and mayhem … who ever said you should never work with pets .. it was an interesting evening – the animals were well under control, but there was lots of things to learn and to take forward from the session. Working with a model on a table top you had to work quickly, the lights had to be prepared before the model was put in the scene, the treats had to be worthy and you had to be able to get the pets attention. The pets preferred to be looking at their owners than the photographer… so that had to be considered, and it was of course essential to make sure the dog looked his best and did not jump off the table. Some dogs liked to be rewarded with treats, others were not interested in treats at all – to be honest this young lady was an experience model and to be honest new exactly what she was doing… she was not dressed for the shoot…. Add some antlers and she was ready … the snowman helps with the sense of scale to the picture – a perfect Christmas card image for the owner to send out. There was only one animal that wee’d and poo’d on the studio floor – a hazard of working with pets and that was surprising the tortoise … once he had relaxed he did move relatively quickly, and although I felt lacked facial character, I was pleased to be able to capture him with a shadow under his shell … so that there is a sense of movement. Note the brown shoes co-ordinate really well here and the interaction between the pet and the owner. You can imagine the eye contact between the adult and the dog, this time the jeans are darker – so is the dog… and the black collar on the dog copies the black straps the owner has dangling down. Another dog, another owner – the old worn shoes on this own and the saggy looking jeans, reflect the saggy skin almost worn skin of Humphrey. I deliberately shot this one on the diagonals, as that was the only way from the angle I was shooting get clean space between the dog and the owner. I am forever playing it safe, I use Aperture priority mode a lot, I adjust the exposure compensation to get the shot that I want but if you mention shutter speeds, I somehow quiver with terror and think I can’t do it – so I really need to practice this more… in my head I am always converting… faster shutter speed = wider aperture, so I tend to pick Av and go from there… but I really do need to discover and use this function on my camera and relate it to back button focusing. So today I choose Shutter priority, auto ISO and trusted the camera … my model was Sparky and I wanted to freeze the action of him running on his walk…. I took lots of photos – nearly 100 trying to get it right (80 ended up straight in the recycle bin as were not in focus – I had a problem with focusing & tracking – but I discovered lots!). First I tried to fill the frame with the farmer’s crop, the sunlight was really strong and produces a really vibrant background and in lightroom I had to lighten the shadows on Sparky’s face. Trying to get Sparky to run in the direction I wanted was impossible, I also felt that 1/2000 sec was nit fast enough to freeze the movement so I choose to increase the shutter speed. It became apparent that the stronger shots were when there was room in the frame for Sparky to run into, where I had the whole dog in the frame. It also became apparent that the more vibrant colours were in the grass when it was back lit, so to capture that vibrancy impacted on the timing I shot the image. I think this is great, the fast shutter speed has given a great depth to the photo, I have got his eyes focused on something – just wish it was me … but I have taken it close to the end of his tail … I need to zoom out more. Aiming for me, you can see how happy he is – but you can’t really tell how fast he is moving in this shot… I think I zoomed out too far. This was an experiment with angles, I love the texture I added to the grass by getting lower but I never checked out the backgrounds and Sparky has a tree growing out of his head! The low angle though makes the dog look large, that he could stand his ground and be determined to reach his goal. Then an angle change, Sparky is still moving around but this time I am looking down at him, and he looks much smaller in size and less dominating in the image. ISO640. 1/2000 sec, F5 – Coming towards me. I am going to practice some more with this… Sparky is a great model so you may see him again! I have been out on a few walks recently trying to capture Bluebells as they are just coming into flower in some pockets of the New Forest National Park, and I love them – rather than posting each time I photograph the bluebells my plan was to collect all the images together and choose a few of my favorite shots to share over a couple of days. Most of the time when I am out taking photos and walking … I am taking my photo buddies along with me – Mack is a Golden Retriever, he is about 8 and belongs to my husband – he plods along slow and steady and Sparky (my Border Collie, 11 months old) is a bit of a wild card, full of energy and up to mischief and likes to try new things… Trying to get them to behave whilst I position my camera is never easy – if they are on the lead they tug, and ruin the shot by causing me to move the camera, they frighten away the wildlife and they just can’t help getting into shot. Taking photos of bluebells was a real challenge – they liked the same spots I did, Mack liked to roll on the bluebells and flatten them … Sparky like to sneak into a picture unannounced just as a I pressed the shutter button. So today’s photos that I am sharing are of my “unhelpful photo buddies”. ISO100, 100mm fixed lens, F3.2, 1/200 sec – I love how the flowers are in focus and then Sparky appears! ISO100, 100mm fixed lens, F8, 1/125sec – I got down low to capture the dappled shade on the bank and Mack sat down in front of me! ISO160, 100mm fixed lens, F6.3, 1/40 sec – I shady path perfect to walk along… with the slow shutter speed Sparky is blurred slightly! The plan is to show you some more bluebell photos tomorrow – I have to edit them first and I have downloaded Lightroom CC to experiment with for a month’s trial. Today – a walk in the New Forest, which for me is all about capturing a moment in time, something that I see that inspires me… sometimes there is a reason… sometimes there is nothing more than to capture that moment, that memory, that image. 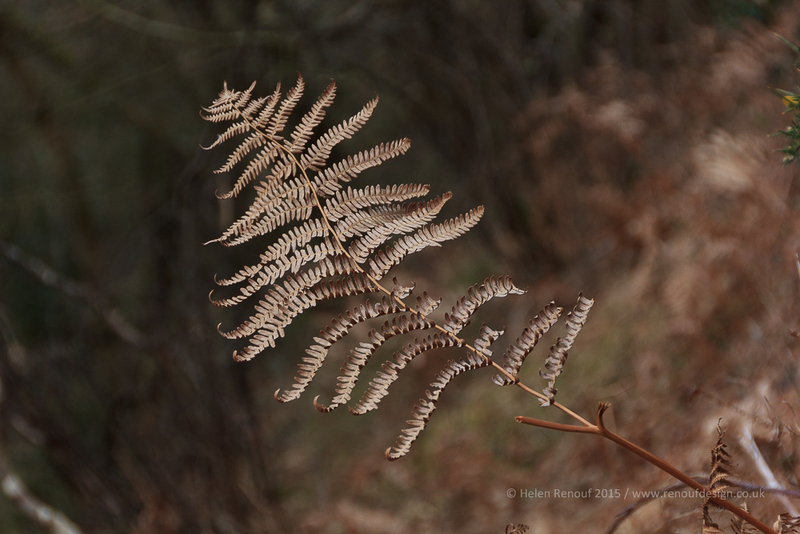 This bracken was calling out to me – it was blowing gently in the breeze and I wanted to isolate it from the background – the diagonal I think work, and I think it is great how you can get one leaf to stand out against many – and how fragile and dried it was… having lasted through the winter. 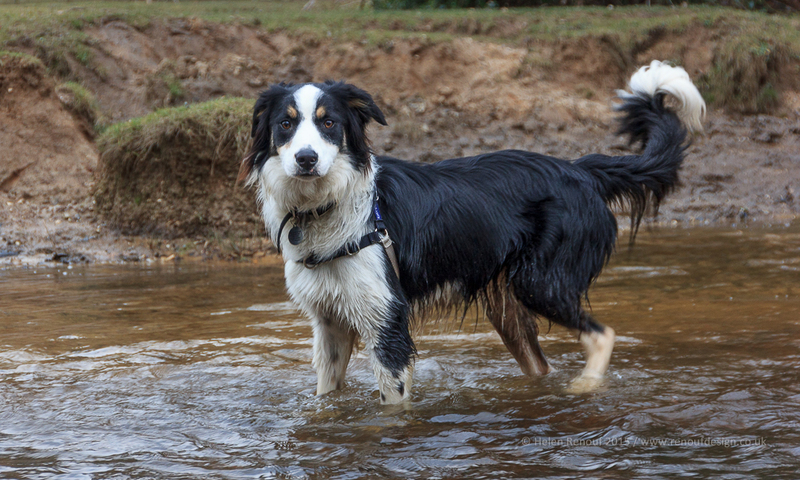 Sparky, at the weekend we say him in action, today he is in water – he rarely does that … but in this photo I was reminded how much he has grown – he is just a puppy (born May 2014) and here he looks so grown up! My best walking buddies – but it is also a great example of the power of red – the lead grabs your attention. It is also an unusual shot for me, I have cut the human in half … but I think it works – you are lead along the picture and end up wanting to know what – what are they both looking at? Something different – I took some video yesterday of my puppy – Sparky playing ball in with an automatic ball thrower in the garden … this was recorded on my iphone and it is what I used to try and capture the action shots of him the other day. Videoing is not something I am that comfortable with – I can do it on my camera and on my phone and I have worked out that if edited in Photoshop CS6 I can grab stills from it … which I think is rather clever. You can see a couple of edits below. 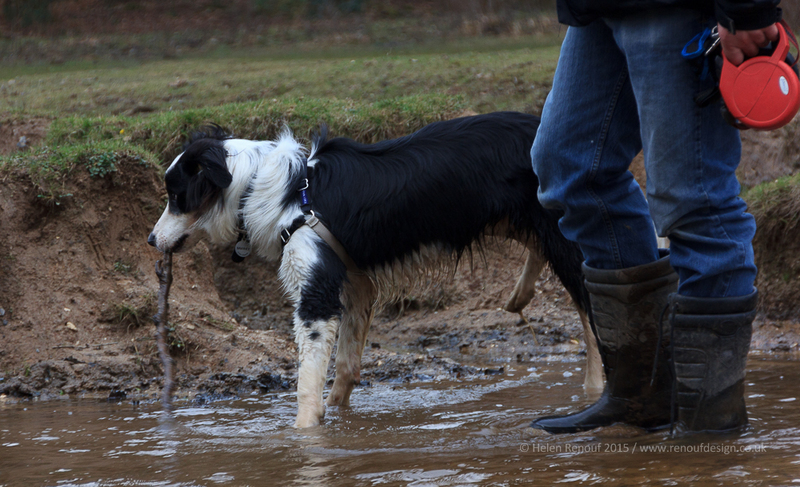 I uploaded the video to my dog’s facebook page – https://www.facebook.com/Sparky.BorderCollie – which only has 49 followings and was amazed at what happened in the first 13 hours – the post was seen by 3,076 people and amazingly watched 1,136 times – I sometimes lack confidence in what I am posting – but this I think is brilliant evidence to show that whatever picture or image you choose to share, you never know if it will take off and if it will be the one that makes your famous… so for other people to enjoy your photographic moments you really have to share them with others and see what happens … it might not be as bad as you think! Anyway … I have now added the video to You Tube too…. you can view it here…. This week i was challenged by Emma – #Remarkable2105, to step outside my comforts zone – and for me using using the Tv – Shutter priority mode on my camera is exactly this… so today I did it … I switched to TV and attempted to achieve some action shots of Sparky – my border collie catching his ball. Camera on High speed drive – and changed to take small Raw files, as planning to only use them on the blog, and that stopped the camera slowing down with the processing speed. I must try it again!